GR lanes story began more than 80 years ago, and they have been promoting health and wellbeing through their range of herbal medicines, supplements and other natural products ever since. Today the company remains in the hands of the Lane with them having active day to day roles in the business.Their aim is simple, to improve people’s health and sense of wellbeing. Their range of products includes remedies for moderate problems associated with anxiety, sleep, digestion and pain relief. 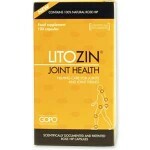 GOPO, based on an extract from rose hips, is a recent remedy for joint inflammation. Key point: Well trusted range of herbal remedies for common health concerns.